This book was way beyond my normal reading zone, and I am SO glad I read it. Seriously. It was creep-tastic! 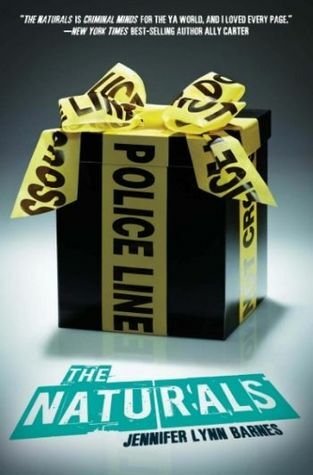 It will be hard for me to review The Naturals without giving away the goods, but I'm going to do my best to tell you what I loved the most about it. In one word: surprises. Yep, it actually surprised me. I think that's a very big deal because I usually figure out the plot of books in the first 75 pages or so. With that said, I did know where The Naturals was headed but it still ended up being a surprise. I was in the ball park, but my glove was not on. Obviously the big reveal at the end left me saying "holy crap" but it wasn't the only surprise along the way. There were several little twists that made me stop and think for a second before continuing the story. I absolutely loved being inside of Cassie's head. The whole concept of being a profiler working for the FBI (but being like the alpha-profiler) was very interesting and fresh for me. Maybe there are books like that out there, but I don't know about them. My only complaint was the weird "You" chapters throughout. They were kind of weird for me. I understand the purpose behind them, but they still felt off. It just gave me the impression that they (the chapters) were trying to hard to fit in. Maybe that was just me. They did help move the plot along and give insight into what was happening on the serial killer's end of things without making the story too long. In a nutshell, I'm glad this one made it to the Teen Read's 2014 list. It's pretty suspenseful. In fact, it kept this girl from wanting to go out to eat because I wanted to finish the book in one sitting... and to keep me from food AND my favorite restaurant is pretty huge. If you are looking for a true page-turner, pick this up. Pronto.